Is LinkedIn Evolving for A Younger Workforce? What Marketers Should Know About "Stories." Seems as though they’re finally jumping on the ‘stories’ bandwagon. Other platforms like Instagram and then Facebook were quicker to add this functionality to their apps. With LinkedIn’s audience typically skewing older and more professional, it begs the question; is LinkedIn evolving for a younger workforce? Survey Says… Yes! Clearly, through adding a Snapchat-like stories feature, along with a few others, the social site & app aim to pique the interest of a younger crowd. 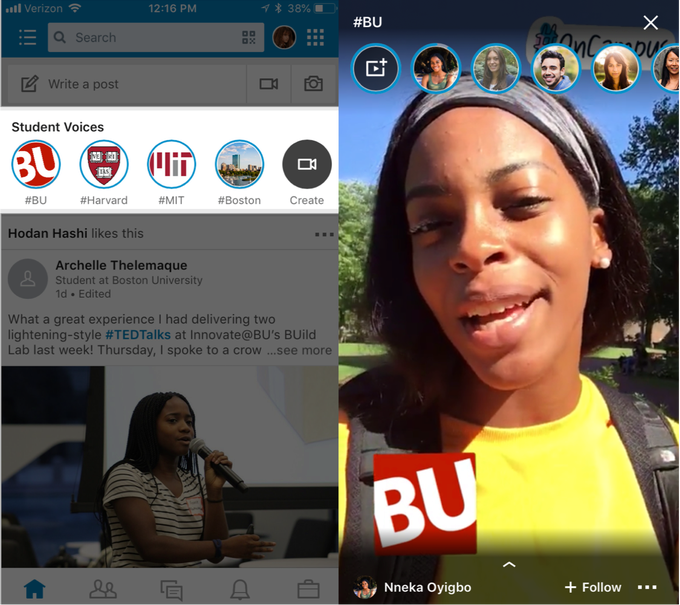 Snapchat’s original purpose of stories was to create spur of the moment videos/photos that disappear (so you don’t have to worry about its impact on your reputation), but according to TechCrunch, LinkedIn’s purpose of including stories is to improve reputation and for students to build their network. On top of its new integration with Vimeo, LinkedIn has clearly put more focus on video over this year. But why are they testing out these new functionalities? With millennials taking over the workforce, most presumably, it’s to attract and engage a younger audience. But why do younger audiences crave things like ‘stories’? They’re core to apps that skew younger, like Snapchat and Instagram. What we mean by ‘human’ is the ability to express oneself and build trust with an audience as close to an ‘in-person’ interaction as possible. Adding the ability to create unrehearsed, in-the-moment content via stories evokes a different sort of relationship building opportunity amongst LinkedIn’s users. It’s also a great way to build a personal brand. Stories, videos, more unique reactions - they all aim to be more human in a tech space, let alone the professional world. Though the platform changes aren’t revolutionary, surely we can all admire LinkedIn for focusing on more ‘human’ interactions. These updates are currently only available for universities and some users. No word yet on if they’ll make a full rollout or when that would be (so just hang tight for now). As marketers, what should we take away from a social site’s update like this? First, stories are taking over on all major social platforms - don’t ignore them. Test out the functionality with your audience and use it to show your personality - and keep it human! Second, if your audience is on LinkedIn and you want to make a bigger impact there, you NEED to invest time in video - pre recorded, or maybe stories in the future - whatever it may be. There’s no doubt that video is essential to building trust today, and everyone should take note when a platform is making changes to push video more. As we see all the time, sites and apps will continue to evolve and we must be prepared to evolve with them. As users test new features, it opens up a way for us to communicate with our audience differently. Stay tuned here and on LinkedIn for further updates on these features.